Before Dr. Huizenga (the doctor behind The Biggest Loser), there was this curly haired guy with short shorts and a big voice that knew what we know now -- that fat people (1) don't want to be fat but (2) are entirely capable of changing their lives. 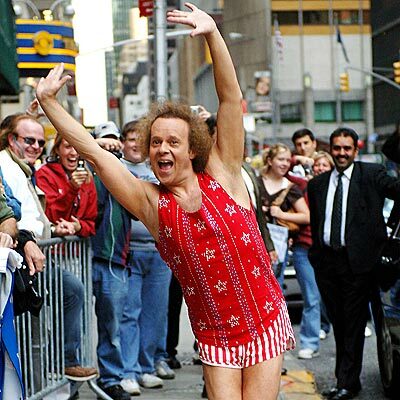 Before there was the Biggest Loser, there was Richard Simmons (who celebrated his 62nd birthday this past week). I know he's been spoofed, praised, mocked, and villified over the years, but more than anything he has been adored. There is no gimmick. Everything from his videos to his Food Mover promotes these simple ideals. Have you tried to lose weight for your parents, your spouse or your children? Look, it's just not good enough wanting to lose weight for others. You have to look deep inside and ask yourself what will make you happy. What will put a smile on your face and add a little pep to your step? I read in so many blog/facebook/twitter messages that so many of you see dieting as this delicate balance between control, gratification, deprivation, and splurging. I read people wanting to lose weight quickly. I read people getting upset over losing only small amounts. I read people getting down on themselves because they ate something they truly wanted. WHAT GIVES!?!? I want to say over and over again that living our lives is not this tightrope of success and failure, but it's a pursuit of happiness. And yes, I chose those words very carefully. When we choose to go down this path, it's a path of liberation, freedom, and independence from all the thoughts, feelings, and (in)actions that got us to where we were. You have to look in the mirror and say to yourself: "I'm going to lose this weight and it has to be all about me, me...ME!" Keep filling your mind with positive thoughts about yourself and just wait 'til you see the positive things that will happen in your life! And let me tell you something. There's so much to like about you. I mean that. You're a good person, filled with kindness. You have a good heart and you care about others. You're smart, you have a wonderful sense of humor and people really like you. Please build on those positive qualities about yourself. Yes...I want you to get every morning liking who you are! I want you to walk up to that mirror in the morning and really like who you see. And remember, all of these positive changes in your life begin with your wanting to always please...YOU! I'm beginning to look at my body much differently now. From the grace of my ankles, to the strength of my arms, to how my belly is changing, to how strongly my heart is beating. More than being worthy of the healthy food, and the exercise, I'm finding that I'm worthy of my own body, of loving it, of it being loved. Yeah I might post self-depricating comments about myself, but I'm not yet at the point where I'm ready to toot my own horn publicly. *sigh* I love Richard. Seriously. I've been a fan for twenty years or more. He's so darned positive, how can we not smile and think good about ourselves? Wow. What a fun post! I love his attitude...but remember when Richard Simmons was a complete joke? Maybe he still is...but somehow his words ring so much truer than I had ever thought. I remember my middle school gym teacher making us do Sweating to the Oldies on a rainy day. He was a joke to most people (at least physically fit ones). But I don't think he's a joke. He's taken some of the most obese people that people would rather ignore, and helped them become healthier. I mean, what would the world be like if every nutritionist, doctor, or personal trainer gave their services to someone who truly needed them simply because they (1) understand and (2) care? There's so much good new broadway to be done! It's just something fun to do to change things up, or for many people, it's the starting point to get them to do something. I think they're brilliant videos. My ex-husband and I used to workout with Sweating to the Oldies w/Richard - it was fun :) I haven't seen him in awhile now. Does he still have his own program? He's still very active in the whole weight loss/inspiration field. He's such a dear! OMG I LOVE RICHARD SIMMONS!! i just started following your blog =) great post! I adore Richard Simmons. I have five of his videos, I have the food mover. He is the reason I am running now. I was depressed and sad and I just felt fat and hopeless and I sat on the couch and watched Sweatin' 1 because I liked the music and I remembered being able to do it when I was younger. And.. eventually I got off the couch and just did it. I went on Amazon, ordered his 5 dvd set and began to feel better about myself. I think I just love that he treads where others feared to -- he took on some of the most obese people in the country and became their personal cheerleaders. "I read people getting down on themselves because they ate something they truly wanted." I feel like I do this all the time and it actually led to an argument between my husband and I...but only because yes, I wanted it in the moment but the instant gratification wasn't worth the setback that it gave me. It's tough to not get down on yourself when you have the perspective of "oh ok, now I ate it, it wasn't THAT good"
Kyoto -- I think eventually you become attuned to your body and the ability to predict "will this satisfy me?" I ate 240 calories of M&Ms yesterday and was satisfied by eacn and every one. I love love love Richard Simmons. I've lost 107 pounds, and I'm still on my journey to the healthiest version of myself. And Richard's workout DVD's have helped me "party off" many of these pounds. :) He will always be my hero.. Shrinking Kenz -- congrats to hear about your success. You're proof that it works: Eat right, move more, love self!